In the year 2000, when I was thirteen, my mother seemed to give up on trying to surprise me with Christmas gifts. I was now allowed to choose all my presents, even stand in line with Mom while the bar codes buzzed over the checkout laser, watching as she forked over the family’s hard-earned cash for a new Playstation game or a stack of books six deep that I couldn’t wait to dig into. Mom forced me to go to Walmart with her on Black Friday that year. She claimed it would be good bonding time for us, but really, she needed a second soldier on the field of retail battle, and my dad was too tired to tag along. For us to get all the best deals, we would have to split up. Mom would head toward the clothing side of the store to grapple for flannel pajamas, socks, and jeans, while I would be deployed to the toy section. I was a slight girl, with mousy brown hair to my waist, unassuming and small. It would be easy for me to fight the crowds, and rabid adults would be less likely to grapple with a child. The two of us would reconnoiter in electronics, where the gem I had chosen to cap off my Christmas crown waited in the video game case as my reward—Final Fantasy IX. This particular year, there was one toy which outshone all the others, one present my little sister Antonia had talked about day and night since the commercials began airing on Nickelodeon months before. This holy grail of holiday satisfaction was known as Poo-Chi. 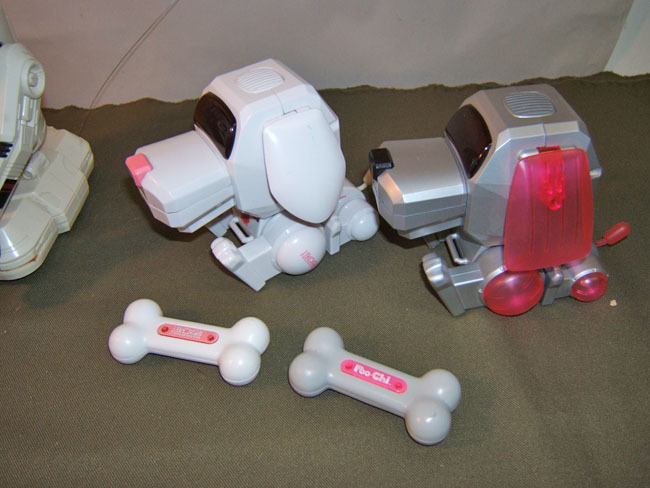 Poo-Chi was a robotic dog from Japan that responded to voice commands. His eyes turned into the shape of hearts when you made him happy. He barked his robot bark and glared when he was angry.He even opened his mouth and played “Ode to Joy” if you asked him nicely. My little sister could not live without him, despite the real dog that was chained up and ignored in our backyard. Obtaining Poo-Chi was my only objective that morning. It was the “us” in her statement that rang in my mind. I had only recently discovered how short-lived the satisfaction of Christmas really was, and I wanted to keep it pure for my sister as long as possible. She desperately wanted Poo-Chi, needed him with a clarity that I understood. Poo-Chi would make her life great for a moment, elevate her above our working-class existence, out of our parent’s failing marriage and the shadows it cast which she couldn’t understand. She would have him. I was determined. The doors to the store opened at exactly 4am. People began to run like cattle in a chute. As we entered the atrium, I saw employees in their blue vests arrayed along the walls, standing back from the stampede, some holding megaphones which they might use to try to maintain order if things got out of control. Mom kept an iron grip on my forearm, dragging me behind her into the store itself. “Electronics in ten minutes,” she reminded me. She grabbed a cart, and the last I saw of her she was striding toward the men’s clothing section, purposeful but not frantic. I was frantic, my heart thudding in my throat. Already sweating, I tugged off my winter hat and shoved it into my coat pocket as I pressed my way toward the toy section. Around me seemed to be nothing but overweight women wearing gaily-patterned pajama pants, cups of coffee firmly clutched in their plump hands, snow melting from their boots, turning the floor into a brown quagmire. All their faces were pasty, hostile, looking at me like I was an interloper. I saw no other youngsters that I remember save the very young toddlers squashed into those uncomfortable seats under the cart handles, screaming at the top of their lungs or somehow sleeping amid the chaos. What males there were served as buffers for their women, parting the crowds before them like curved metal snowplows through drifts of meaningless sleet. I slipped between bodies like a beam of dust mites, molding myself to any space I saw, the slippery soles of my Converse high-tops sliding on the linoleum as I arrived in the toy section and skidded to a stop, my head on a pivot for the telltale sale sign, the rows upon rows of robot pets, the hinged smile of my sister’s new best friend. The signs were there, but the shelves where Poo-Chi had been stocked were already stripped bare, empty like the branches of the trees in our yard, barren like the cornfields we had come from to reap the bounty of consumer civilization. I stood uncertain and shocked in the shadowy half-lit aisle as around me frantic parents scurried to sweep up Barbies, Hot Wheels, Pokemon cards and Beyblades. The horde had only been allowed in the store for the past few minutes. How were all the Poo-Chis already gone? I felt the unfamiliar weight of an adult failure settle into my heart—I knew I had let someone down, someone important, someone who could not do for themselves what was needed. My sister would have a bad Christmas because I had not been quick enough. Just as my spirits sank, I saw one, a Poo-Chi, with purple ears and tail, his silver plastic tongue lolling from his automated mouth. The electronic visor where his digital eyes would appear was dark, masking his intent like a pair of sunglasses on a police officer. He was behind a larger box, whether hidden there deliberately or shoved accidentally by frantic grabbing hands I didn’t care. He was mine, left for me by chance or God or maybe even Santa. I slid toward him without urgency, trying to appear nonchalant as I stooped to grab the package. I was startled to meet warm flesh, a texture I recognized from holding the hands of my grandmother. Thin skin, soft with age, rippling under my palms like malleable dough as they tried to tug the doll away from me. I looked up to meet the eyes of an old woman, her hair dyed a false yellow, styled in absurd curls despite the early hour. Her red fleece sweatshirt had a snowman on it. We stood close enough together that I could smell the mint of her toothpaste, masking a more medicinal undercurrent that might have been denture paste. She glared back at me, her expression a mixture of befuddlement, dismay and agitation. I expect my return expression was similar, but my determination was stronger. This Poo-Chi was meant for the Peckhams and no other family, and I did the only thing I could think of to ensure his fate was realized. I reached out with one hand and pushed the woman in the center of her chest, right in her snowman. Hard. She stumbled back a few steps, her grip slipping from the sleek plastic of Poo-Chi’s packaging. She spilled onto the yellowed linoleum, her mouth agape. Several people standing nearby looked around. One man shouted, “Hey!” But I was a victor beyond chastisement. I curled the toy tight into my armpit, smiled at her, and sprinted toward the central aisle as if the lady would leap up and pursue me with the same savagery I had shown her. Perhaps she did, but if so, she was not fast enough. Mom was waiting for me in electronics, the cart half-full of clothing. I set Poo-Chi in the child’s seat of the cart, where we could keep an eye on him. Unlike the toddlers I had seen, he was silent, somehow majestic now that I got a close look at him. He had been packaged in a sitting position like a good dog, his little bone with a microchip inside set neatly at his feet. “They didn’t have pink?” Mom asked. “This is the last one,” I said proudly. “He was hidden. I had to fight for him,” I confessed, worried the woman would find us later and tell my Mom what I had done. But Mom laughed. “Good,” she said. “We needed it. Get your game and then let’s go get the rest of the toys.” She put her hand on my shoulder, naming me a comrade, a warrior, maybe even an equal. I felt grown up as I stepped to the counter to ask for my own present, as though I had earned the right to stand there, to be part of the Black Friday masses. We got what we came for, fought our way out of the now-sodden parking lot, and were home by 6am. Mom ended up surprising me with a few trinkets after all, adult gifts like jewelry and makeup that I wouldn’t have chosen for myself. Despite my liking for everything in my pile of paper-wrapped parcels, the best part of that Christmas was watching Antonia open Poo-Chi. I felt a sense of responsibility for her joy as she squealed with delight, as though I had cast the magic of her smile. It didn’t matter what I had needed to do. For one day, this six-year-old was the center of the universe, and she felt it. My father was imposed upon to immediately open the phony puppy and vitalize him with two AA batteries. Poo-Chi sprang to life, yipping and making heart eyes at the assembled revelers. I grinned, turning back to the tree where my brother, eight, was opening a Batman play set with focused intensity. But as soon as I looked away from her, it seemed, my sister cried out in sorrow. The room stilled, the only sound the Christmas special on television as we all looked at her. Antonia held up a piece of translucent purple plastic, her eyes welling with tears. “His ear came off,” she moaned.